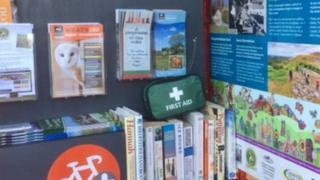 Disused red phone boxes in north Wales are getting a "new lease of life" housing shared community items such as books, bicycle repair kits, dog waste bags and in one case a defibrillator. Fifteen of the iconic boxes are being repurposed across Denbighshire, Flintshire and Wrexham. Councillor Merfyn Parry said of one of the boxes in Aberwheeler: "It's part of our village." "We've lost the shop and lost the pub a number of years ago," he added. "The phone box is something that people recognise as Aberwheeler. Each county has received £15,000 from the Welsh Government's Rural Development Programme. Denbighshire councillor Mr Parry added:"It's wonderful to see that they are having a new lease of life, people like to see them. It's like the police man's helmet, there's something British about them, isn't there?" So far Denbighshire has completed two phone boxes, one in Eryrys and another with a defibrillator in Glyndyfrdwy. Three more are in progress in Aberwheeler, Maeshafn and Tafarn y Gelyn. Flintshire has completed one at Gwaenysgor and another in under way in Ysceifiog. Wrexham has plans for boxes in a Gresford, Llay, Bwlchgwyn, Bryncefn and Penley. Each community also has to make a contribution of £750.